So, remember back in the summer how we stopped mowing our lawn? We ended up getting a lot of weeds and wildflowers sprouting up. I liked it, I always like the variety of flowers and colour, and I think an “unkempt” lawn is nicer than a manicured one. In town there are often bylaws against it, but out here one can really do what they like with their property, except for anything that might affect water or other common resources (which can be good or bad, depending on what’s being done and whether you’re the one doing it). Turns out, the birds liked it better too. Yesterday we had a whole pile of snow, which continued to fall for most of the day. Our feeders were inundated with birds. The nyger feeders were overflowing, with all spaces filled with hungry beaks and more waiting in the wings. Some individuals tried out the suet feeder or ventured onto the platform feeder for the sunflower seeds and millet. 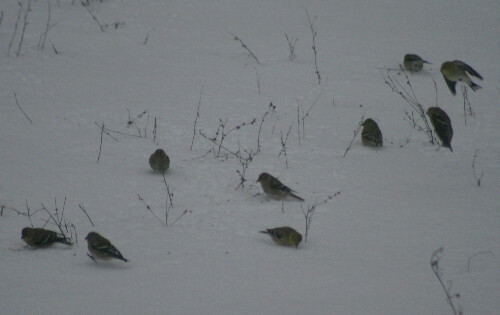 And then there was this opportunistic flock of birds, who discovered the weeds poking out of the snow in the lawn, and started availing themselves of the seeds still clinging to the dead stems. 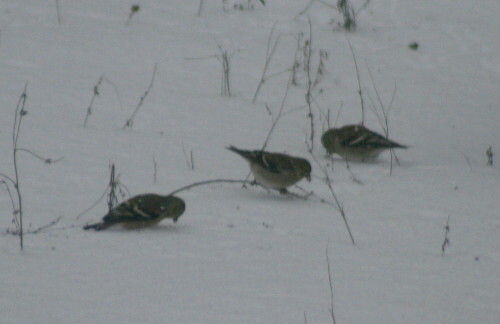 The flock consisted of goldfinches, siskins and American Tree Sparrows, an interesting mixed group. There may have been a couple dozen out there at its busiest. I was glad we hadn’t mowed the lawn. I’ve been enjoying your blog, and learning from it. We too like any lawn we have to reflect a bit of the wild… though some consider it unkempt. And ticks can be a problem some years in too high of grass near water. We have settled on a bare minimum of cut grass around our house, with the rest of the close-in land mixed field, cover and gardens to attract birds and wildlife. We have been (as usual) inundated with snow this year and it looks like the one and only Northern Cardinal that I’ve ever had at my feeding station has given up and headed south (or else succumbed to predation), as I haven’t seen him since Dec. 28th. Our resident blue jays gave him a hard time whenever he lingered at our feeders. Though quite far north of their range, our Xmas Bird Count tallied one pair of other cardinals at a downtown feeder as well as some robins (maybe due to big crops of wild berries this year. Have you seen any birds that are a bit unusual this winter on your rambles? Thanks for stopping by, Don! I’m glad you’ve been enjoying the blog. It’s nice to hear you share the same philosophy regarding lawn care! The birds and other wildlife appreciate it, I’m sure. We’ve had a few birds around here that I’d consider unusual. We had a Red-bellied Woodpecker coming to our feeder for a bit, which are uncommon this far north and east in the province. 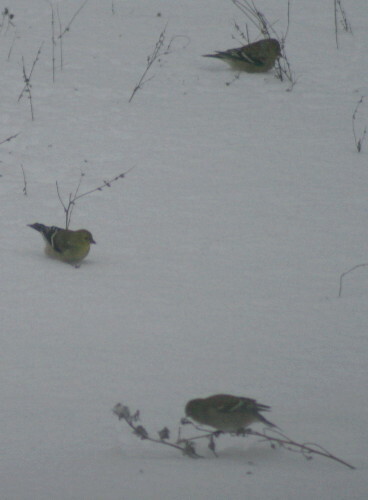 We’ve had Bohemian Waxwings and White-winged Crossbills around, winter irruptives that are hit or miss most years. We did have a cardinal hanging about for a bit in the fall, but she seems to have moved on; we’re at the northern edge of their range here, and despite how common they are in Toronto, she was the only one we’ve seen here. I just started reading your blog and find it very inspiring. My feeders were swamped yesterday during the height of our 8″ snowfall and I wonder what it is about a big snowfall that makes birds frequent my feeders more often. We had big groups of sparrows, juncos and house finches along with mourning doves, chickadees, and a cardinal pair. I noticed the feeder activity abated as the storm did. I live in a suburb of Chicago and have been transforming my yard into a backyard wildlife habitat by planting native flowers, grasses, trees, and shrubs. I don’t believe in using any chemicals and would love to stop cutting my lawn like you do but I am required to keep it cut. As a result of that requirement, I make my planting beds larger each year thus removing the grass. Thanks for the kind words, Darcy! Glad to have you reading. I would probably be doing the same as you if I lived in town – removing the lawn and replacing it with flowerbeds, which are prettier anyway. I’m glad to hear you’ve been “going native”, the birds and critters will love you for it!